I’ve been curious about E Polyanthemos for ages. 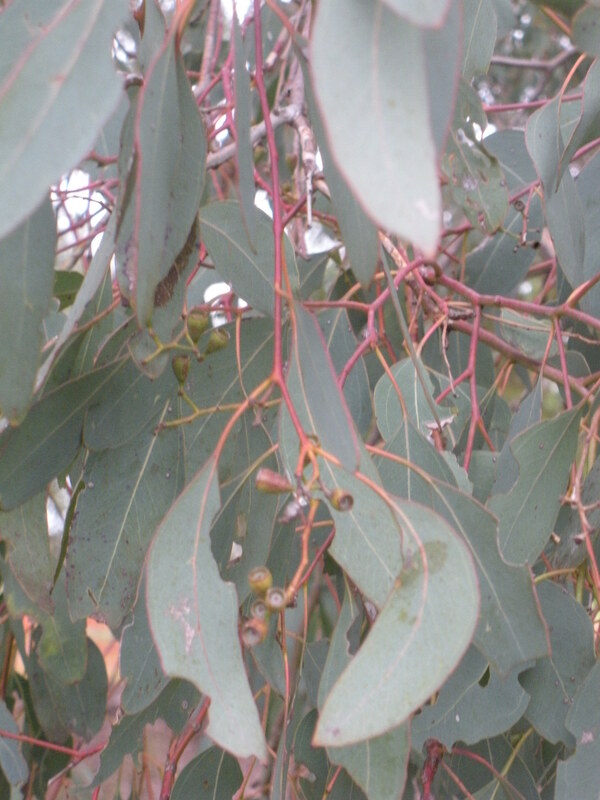 I saw one on a tour of the Currency Creek Eucalyptus arboretum years back and I had already heard it was a good dye plant. I am guessing it is mentioned in Eco-Colour. It has been on my mental list for quite some time. So when I found one that had been identified by a more knowledgeable person recently, I paid a lot of attention. I think the two trees I have been holding in mind as potential examples of E Polyanthmos might actually be E Polyanthemos on the basis of this sighting. It’s a lovely tree–those wide grey green leaves are truly lovely. Evidently, they are also delicious, because this one was covered in leaves that had been nibbled by some kind of insect. And created very interesting prints. It intrigues me that one plant can create such different colours in such close proximity. I have had wonderful colour from the buds of the other two trees I visit from time to time, and the tree is truly spectacular when in blossom, because the many-anthers its botanical name promises are needless to say held on many flowers which attract many birds. 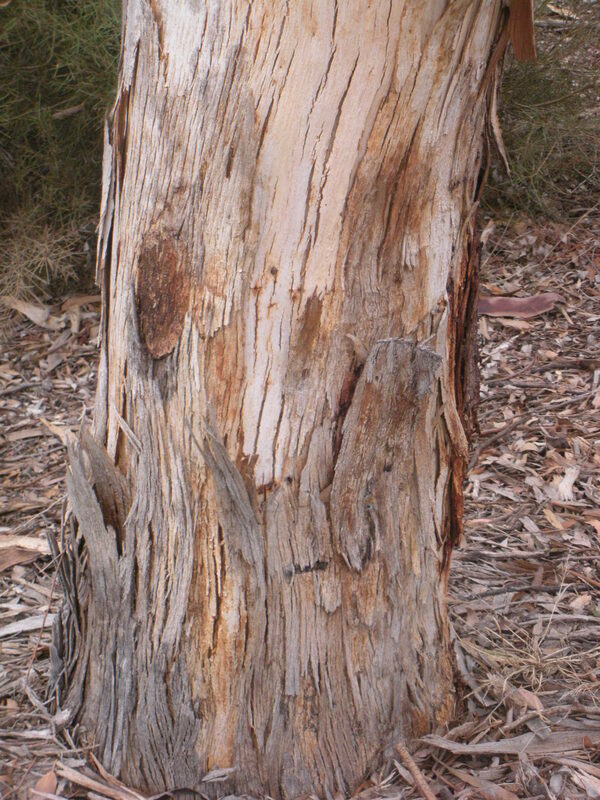 Ah, the glory of eucalypts! very nice, that’s a keeper. 🙂 I suppose the chemicals in the leaves must vary a lot. I was given pruned e. Nicholii (they thought) branches grown here, and they gave nothing! nada. except grey with iron, vinegar and water. but no prints. perhaps not Nicholii. I agree. Perhaps not E Nicholii. After rain, I’ve had disappointing results… but never nothing at all. 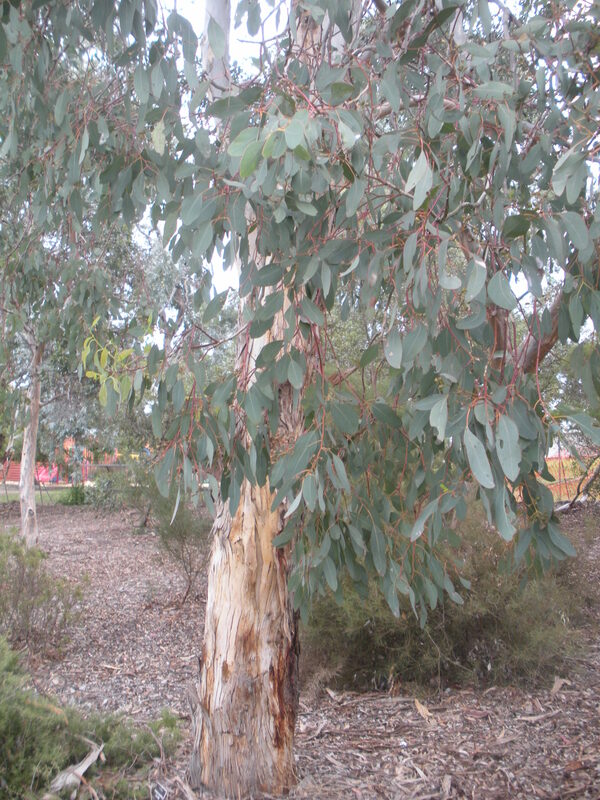 This one was labelled E Polyanthemos at Wittunga Bot Gardens–which is the reason I’ve expressed confidence about its identity. Could still be wrong! There were two or three of them standing together. Weeping habit and grey leaves–yes. Leaf shape… I wasn’t sure at all, working my memory of our conversation in Melbourne. I also get apricot from the two trees I’ve tentatively identified as Polyanthemos… One just off Jetty Rd at Brighton and one opposite a friend’s house at Ethelton.